A table that looks like tapri glass or a chair that seems to be in a yoga asana? Get it from Bombay Atelier, a company that designs furniture with a twist. Farzin Adenwalla started Bombay Atelier in 2013 when she shifted from New Zealand to Mumbai. The brand puts the fun in functional by making quirky furniture pieces that are inspired by everyday Indian things. From a table that looks like a capsized chai tapri glass, or beautiful stools that resemble incense sticks, a gorgeous light that looks like the flared skirt of the sufi dancer or even a chair that looks as though it’s about to launch into the warrior pose. The materials she uses are unusually paired yet sturdy – teak wood, cane, stainless steel, metal. 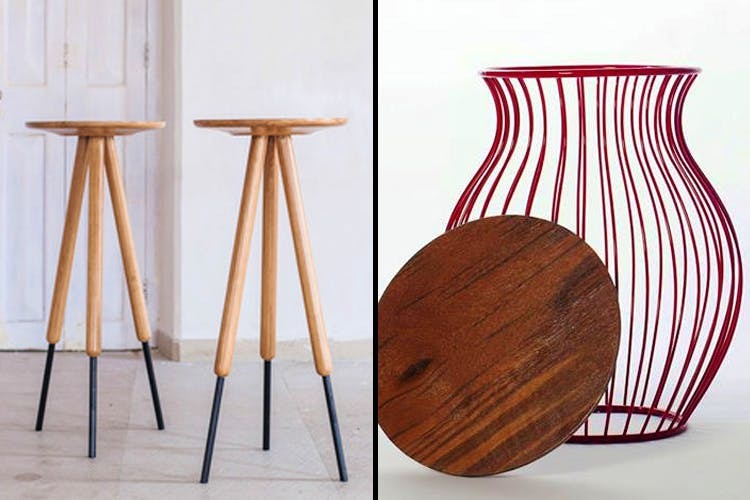 The prices start at INR 17,000 for a bar stool and goes upwards. The chai-inspired table is for INR 27,000. Have a word with Farzin by getting in touch with her on farzin@bombayatelier.com. Alternately, visit her website and check out her lovely collection.